Rambling Rican: Sasuke fans are definitely the best fans in the world! Sasuke fans are definitely the best fans in the world! March is a very special month here on Rambling Rican. March marks the anniversary of this blog! I can't believe it.. FIVE years have gone by since I started this blog! I would never have dreamed how much impact Sasuke would have been in my life. How many lives it has touched. How many people have come together as a result! I've met truly extraordinary people through the internet and this passion of mine: Sasuke. The above photo is very special to me. I got it last month but I didn't post about it until now (Sorry! Health was a bit wonky.. same as usual so no worries). 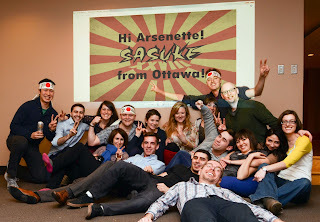 It was from a Sasuke fan in Ottawa, Canada. What I find amazing about this picture is that so many people are there in the photo! It was a fan get-together so they can watch their copy of Sasuke Rising! Now the funny part.. I.. didn't.. read.. the.. sign.. LOL!!!!!!!! I just assumed it was Sasuke viewing in Ottawa.. I've been told before they were getting together in January to do this and so when I got the mail I was going "aww that's cute!".. I mean.. I read the middle.. Sasuke.. I even read the last line.. from Ottawa.. but I DIDN'T read the TOP LINE.. LMFAO... I'm such an idiot.. Now the "Hi Arsenette" sign is almost a Sasuke meme.. First used by Matt Iseman then onwards to fans on vacation in Japan. Each time I was rendered speechless! Still though, I was floored.. again.. After I composed myself from the embarrassment of not noticing my own name and the endless teasing from my husband reminding me how much of a flake I've become.. I was in tears. THIS is what Sasuke Fandom is. Sharing a niche passion with each other! They look like they are having a blast! And I couldn't believe they took the time to say hi to me.. from 450+ miles away! As the sender said.. the power of social media is amazing. This long-time Rambling Rican reader managed to spread his love for Sasuke to an ever growing community in a country that doesn't even HAVE Ninja Warrior. To think that I was even remotely involved in that group in another country as a result of this blog is.. amazing. 5 years ago I was searching through the net for anything about Sasuke and found bits and pieces and a fragmented community. Now.. we've come from all corners of the globe to celebrate how wonderful this show really is and stand with a united voice. I'm happy in the 5 years Rambling Rican has existed that so many fans have come to enjoy Sasuke... and spread that love into their communities to be manifested into wonderful displays of friendship. This is so awesome - are there any other SASUKE maniacs out there that do this? I think we should all send in pictures of people that watch SASUKE from around the world: I think this blog reaches even farther than you think, Arsenette! You made me cry, dammit! Now I'm all gooey with luurve for everyone. Awwwwww snowy :) I'll share in passing tissues. I was floored when I got this.